Mangos, sometimes referred to as a “tropical peach,” are among the world’s most widely produced and consumed fruits, accounting for an estimated 40 to 50% of all fruit produced for juice, canning and fresh consumption, according to Whole Foods Market. This tasty fruit is an ideal springtime treat, at their peak in April, May and June. To select a fully ripe mango, look for smooth, leather-like skin as well as a pleasant aroma. The skin should give a little without being mushy. This delectable tropical fruit offers a wealth of health benefits. A study by Texas AgrilLife Research food scientists found that mangos were able to prevent or stop certain colon and breast cancer cells in the lab. Mangos contain antioxidants such as quercetin, isoquercitrin, gallic acid and astragalin which are known to protect against leukemia and prostate cancer in addition to colon and breast cancers. Clears the complexion. Mangos can be used internally and externally to improve skin appearance including clearing clogged pores and eliminating pimples. Supports eye health. One cup of sliced mango offers 25 percent of the daily value for vitamin A to help promote good eyesight, prevent night blindness and dry eye. Improves digestion. 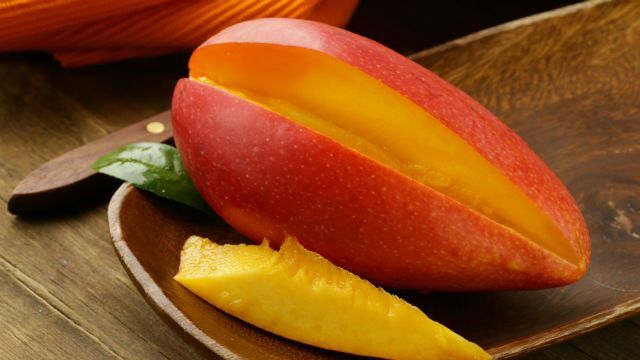 Mangos contain enzymes that help break down protein, improving the digestion process. Its fiber content also aids digestion and elimination. Strengthens the immune system. With over 25 types of carotenoids, vitamin C and vitamin A, eating mangos help boost the immune system to help prevent all kinds of ailments. Mangos are inevitably messy, but cutting one is fairly simple. Just stand it stem-side up and cut down its sides along the long, flat pit and repeat on the other side. Make a crosshatch pattern on both sections with a knife and then invert the cubes so that they can be scooped out. There are many ways to enjoy mango. Fresh or frozen, they can be used to add a fabulous tropical twist to a smoothie, or you might toss a few fresh slices with lime, chili and salt to create a tasty classic Latin American snack. Another option is to blend the ripe pulp with plain organic yogurt – this is a popular Indian dish known as mango lassi. It can also be diced into a salsa, mixed with cilantro, chili peppers and onions, used as a topping for fish or chicken. As the weather warms and grilling season begins, this gluten-free Mango Garlic Grilled Chicken recipe is an ideal way to kick it off right. Blend together the first eight ingredients in a bowl, and then add chicken. Marinade for one hour; reserve marinade. Coat a pan with coconut oil and cook the chicken for about 5 minutes on each side. While the chicken is cooking, heat the reserved marinade with the coconut water in a small pan for 5 minutes, until garlic is tender. Add mango, but do not cook the mango. Remove from heat and pour over the chicken for a tasty sauce. The wonderful mango gives us just one more reason to love spring! 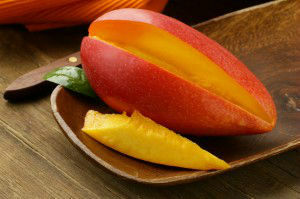 Hey Buddy!, I found this information for you: "Strengthen Your Immune System with Mangos". Here is the website link: https://www.thealternativedaily.com/strengthen-immune-system-mangos/. Thank you.